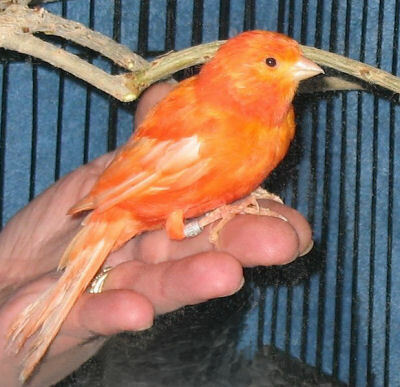 This gorgeous canary, the Red Factor Canary, is prized by many as the most beautiful of all the Color Bred Canaries! Named after its beautiful plumage, the Red Factor Canary is one of the most popular canaries. It is active and lively, enjoyed by both those who wish to keep a pet canary as well as those who specialize in showing. A delightful entertaining little bird, it is hardy and very easy to keep. However they are not easy to breed, so will need a more advanced keeper for this purpose. Distribution: Specialty breeding in canaries has an extremely long history. Even though breeding for "type" was the predominant focus for several hundred years, color breeding was happening intermittently. It wasn't until the 1900's however, that a great deal of interest was devoted to color. In his book, Canaries, Paul Paradise describes the development of Red Factor Canaries and Color Bred Canaries. He says that in 1929 Dr. Hans Duncker, a German genecist, published a thesis stating his belief that a red canary could be developed by introducing a red factor into the genetic structure, possible by introducing a Venezuelan Black Hooded Red Siskin, Spinus cocullatus. Thus began the development of canaries termed "red factor" with the first being successfully bred by a Mr. A. K. Gill in Britain. It is generally accepted that canaries inheriting this genetic structure from their parents can be classed as Red Factor Canaries. At the same time, other colors without the red factor were being readily introduced and became known as 'New Color' canaries. In 1947 the Canary Colour Breeders Association was formed. They initially held to strict rules that no artificial coloring could be fed, and all birds had to be shown in natural colors. Many of these birds lost their coloring after molting and soon in Europe a color known as Carophyll Red became popular, and the no artificial color ruling was removed. Today the Color Bred Canaries are some of the most popular with varied classes not only for just single colors, but for a large variety of different color strengths. Description: A nice well built bird, the Red Factor Canary will reach about 5 1/2 (14 cm) inches in length. These canaries are bred to show and there are many versions of this canary today. They are divided into Melanins and the Lipochromes classes. These are further divided into frosts or non-frosts, which affects how bright their color appears, and then into hard and soft feathers. Stance wise, they should stand perched at a 45° angle and their head should not be snaky or overly long. In all Color Bred Canaries, red and orange pigments are obtained from their diet. Even the color of Red Siskin was found to be dependent on what it ate in the wild. Consequently the Red Factor Canary also requires feeding a special diet to keep its intense coloring. Color feeding means feeding of foods that are specifically designed to enhance color. These are found in three chemicals; primarily carotenoids for most birds with the addition of Canthaxanthin and Beta-Carotene for Red Factor Canaries. Berries, beets, sweet potatoes, squashes, tomatoes, and cherries contain carotenoids which enhance color. Red and orange can also be increased in many breeds by simply adding cayenne pepper and paprika to the diet. A carotenoid concentrate is also used by some experts and Canthaxanthin and Beta-Carotene are obtained as commercial supplements. These color feeding chemicals must be used carefully with close attention paid to proper quantities. All canaries do like to bath, so they should be offered a bird bath. Cage cleaning and toe nail trimming is about all the maintenance canaries need. Breeding/Reproduction: The Red Factor Canary is more difficult to breed and so this is recommended for a more advanced keeper. Most canaries breed easily and readily if provided with quality food, lighting, secure surroundings, and conditioning. Breeding season for most canaries is usually from December to April. They are best bred in breeding cages.They lay their eggs in a nest. The female will lay 3 to 6 eggs, one per day. It is best to allow a hen to have only two clutches. Availability: Red Factor Canaries are usually available.They can often be found at pet stores, and are also be readily found through bird shows, bird clubs, breeders, and on the internet. It could be that the color of this canary is the result of the coloring in one or both of the parents, but diet can also bring out color. And yes, it has long been stated that when cooking with teflon coated pans they can put off a toxin. Birds are extremely sensitive to airborne toxins, even things like hair spray, pesticides, and oven cleaner can cause death. Very true! Lol I do same thing, thanks for sharing. I am just starting to learn about the canary. I have always wanted a singing canary and my favourite colour is orange so to have an orange singing canary I would be all in my glory. I was told that my canary is not a red factor so I had no hope. A friend of mine gave me some red granulated stuff that he feeds his canary to keep it orange, I tried it and mine is turning colour. What is this stuff and where can I buy it? Hi, you can find it at any pet store, is is not dangerous for your birds, only problem is that if you stop to supply it as your bird is not a mosaic or a red factor, your bird will get back to his normal color. My 6 yr old male canary is molting/picking his feathers; tail feathers,back and breast. He usually molts in the Spring. He gets fresh apple, brocolli and celery along with a variety of quality seeds daily. He still takes a bath daily. Any suggestions? You could try adding extra proteins, and maybe vitamins and minerals during this time as well. Egg food is a great protein source for canaries and finches.